අහු (Morinda citrifolia) ඉන්දියන් මල්බෙරි,බීච් මල්බෙරි චීස් ෆෘඩ් ආදී නම් වලින් හඳුන්වයි. මෙම ශාකය කෝපි පවුලට අයත්ය.නිජ භූමිය අග්නිදිග ආසියාවයි.ඉන්දීය උප මහද්වීපය පැසිපික් දූපත්,පොලිනීසියන් දූපත්,පෝටොරිකාව හා ඩොමිනිකන් ජනරජය වැනි රටවල මෙය ව්‍යාප්තව පවතී.දකුණු ආසියාතික රටවල විවිධ මිත්‍යා විශ්වාස ඇදහිලි අභිචාර ක්‍රම සදහා මෙම අහු ශාකයේ විවිධ කොටස් යොදාගනී. මොරින්ඩා සිටිෆෝලියා (morinda citrifolia) යන උද්හිද නාමයේන් අහු ශාකය හදුන්වයි.ලංකාව,ඉන්දියාව,මලයාව,ශාන්තිකර දූපත් හා උතුරු ඔස්ට්‍රේලියාව යන රටවල වැඩෙන වඩා උස නොයන අඩි 3-4 අතර උසැති ගසකි. රිකිලි සිනිඳුය ශාඛාකුඩාය.පත්‍රය අණ්ඩාකරය,ඝණය,පත්‍රයේ නාරටිය ඉතා පැහැදිලිව පෙනේ පුෂ්පය සුදු පාටය , නාළාකාරය,මලක දිග අගලක් පමණය ගෙඩිය අණ්ඩාකාර අෂ්ටිලයකි. ඒය අගලක් පමණ දිගය, මාංසලය,මෙම ශාකය ලංකාවේ නිරිත දිග ප්‍රදේශයේ ගෙවතු මොරින්ඩා ට්ංක්ටෝරියා නම් ත්වත් අහු විශේෂයක් යාපනය, ත්‍රිකුණාමලය හා අනුරාධපුර යන වියලි ප්‍රදේශවල වැවේ. අහු දේවර්ගයම මුලේ පොත්තෙන් රතු පාට සායම් තනා ගැනේ අහු රුබියාසේ (Rubiace) කුලයට අයත්ය. Noni grows in shady forests as well as on open yellow shooes rocky or sandy shores. It reaches maturity in about 18 months and then yields between 4–8 kilograms (8.8–17.6 lb) of fruit every month throughout the year. It is tolerant of saline soils, drought conditions, and secondary soils. It is therefore found in a wide variety of habitats: volcanic terrains, lava-strewn coasts, and clearings or limestone outcrops. It can grow up to 9 metres (30 ft) tall, and has large, simple, dark green, shiny and deeply veined leaves. The plant flowers and fruits all year round and produces a small white flower. The fruit is a multiple fruit that has a pungent odor when ripening, and is hence also known as cheese fruit or even vomit fruit. It is oval and reaches 4–7 centimetres (1.6–2.8 in) in size. At first green, the fruit turns yellow then almost white as it ripens. It contains many seeds. It is sometimes called starvation fruit. Despite its strong smell and bitter taste, the fruit is nevertheless eaten as a famine food and, in some Pacific islands, even a staple food, either raw or cooked. අග්නිදිග ආසියාවns and Australian Aborigines consume the fruit raw with salt or cook it with curry. The seeds are edible when roasted. 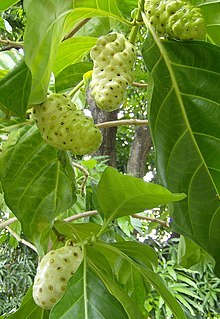 The noni is especially attractive to weaver ants, which make nests out of the leaves of the tree. These ants protect the plant from some plant-parasitic insects. The smell of the fruit also attracts fruit bats, which aid in dispersing the seeds. Nutritional information for noni fruit is reported by the College of Tropical Agriculture, University of Hawaii at Mānoa who published analyses of fruit powder and pure juice. Analyzed as a whole fruit powder, noni fruit has excellent levels of carbohydrates and dietary fiber, providing 55% and 100% of the Dietary Reference Intakes (DRI), respectively, in a 100 g serving. A good source of protein (12% DRI), noni pulp is low in total fats (4% DRI). The main micronutrient features of noni pulp powder include exceptional vitamin C content (10x DRI) and substantial amounts of niacin (vitamin B3), iron and potassium. Vitamin A, කැල්සියම් and සෝඩියම් are present in moderate amounts. Nutrient analyses for a major brand of noni blend juice were published in 2002 by the Scientific Committee on Food of the European Commission on Health and Consumer Protection during a test for public safety of noni juice. The major brand's ingredients include noni purée and juice concentrates from grapes and blueberries. Excepting vitamin C content at 31% of DRI in each 100g, the juice had limited nutritional content. 100g of juice provides 8% of the DRI for carbohydrates, only traces of other macronutrients and low or trace levels of 10 essential vitamins, 7 essential dietary minerals and 18 amino acids. Although the most significant nutrient feature of noni pulp powder or juice is its high vitamin C content, this level in the noni juice blend provides only about half the vitamin C of a raw navel orange. Sodium levels in the noni juice blend (about 3% of DRI) are multiples of those in an orange. Although the potassium content appears relatively high for noni, this total is only about 3% of the Recommended Dietary Allowance and so would not be considered excessive. The noni juice blend is otherwise similar in micronutrient content to a raw orange. The history of published medical research on noni phytochemicals numbers only around a total of 110 reports which began appearing in the 1950s (searched in September 2008). Just since 2000, over 100 publications on noni have been published in medical literature, defining a relatively young research field. Noni research is at a preliminary stage, as it is mainly still in the laboratory as in vitro or basic animal experiments. alkaloids – naturally occurring amines from plants. Some internet references mention xeronine or proxeronine as important noni constituents. However, as no reports on either of these substances exist in published medical literature, the terms are scientifically unrecognized. Further, chemical analysis of commercially processed juice did not reveal presence of any alkaloids. Although there is evidence from in vitro studies and laboratory models for bioactivity of each of the above phytochemicals, the research remains at best preliminary and too early to conclude anything about human health benefits provided by noni or its juice. Furthermore, these phytochemicals are not unique to noni, as nearly all exist in various plant foods. Laboratory experiments demonstrated that dietary noni juice increased physical endurance in mice. A pilot study in distance runners showed increased endurance capacity following daily intake of noni juice over three weeks, an effect the authors attributed to increased antioxidant status. සංස්කෘත වෛද්‍ය ග්‍රන්ථවල අහු හැදින්වෙන්නේ අච්ජුක යන නාමයෙනි. අහු ශාකයේ කොළ, නැටි සහ මුල් ඖෂධ වශයෙන් ගනු ලබයි. අහු විෂසමනය කරයි. වණ සුව කොට මස ලියවයි.ලේ වැගිරීම නතරකිරිමේ ශක්තියක් ඇත.උණ,අතීසාර හා වාතරෝග නසයි.ගෙඩි පැසවීම සඳහා දේශීය වෙදකමෙහි අහු නැටි ගනු ලැබේ.අමු අහු ගෙඩි බැද ලුණු සමඟ ගෑමේන් දත් මුල් සවී වන බව දේශීය වෛද්‍යවරු කියතී.අහූ ගෙඩි ශාන්තී කර්ම සඳහා ප්‍රයෝජනයට ගනු ලැබේ. Noni's reputation for uses in folk medicine extends over centuries. It is widely used in India and being explored by medical researchers for use in the treatment of cancer. No medical applications as those discussed below have been verified by modern science primarily in the United States; where as the FDA (Food & Drug Administration) which regulates the food & pharmecuetical industry in the nation implemented its own regulation that "Only a drug can cure, prevent or treat a disease." Therefore anyone else who claims a cure otherwise may be subject to false claims. The noni fruit is taken, in Indochina especially, for asthma, lumbago, and dysentery. [තහවුරු කරන්න] As for external uses, unripe fruits can be pounded, then mixed with salt and applied to cut or broken bones. [තහවුරු කරන්න] In Hawaii, ripe fruits are applied to draw out pus from an infected boil. The green fruit, leaves and the root/rhizome have traditionally been used to treat menstrual cramps and irregularities, among other symptoms, while the root has also been used to treat urinary difficulties. There have been recent applications also for the use of oil from noni seeds. Noni seed oil is abundant in linoleic acid that may have useful properties when applied topically on skin, e.g., anti-inflammation, acne reduction, moisture retention. In Surinam and some other countries, the tree serves as a wind-break, as support for vines and as shade for coffee trees. ඇතැම් රටවල අහු කොළ ආහාරයට ගනී. ↑ Krauss, BH (1993). Plants in Hawaiian Culture. Honolulu: University of Hawaii Press. ↑ Saleem et al. (2005). An update on bioactive plant lignans. Nat Prod Rep 22:696-716. ↑ Deng S, Palu AK, West BJ, et al. (2007). Lipoxygenase Inhibitory Constituents of the Fruits of Noni (Morinda citrifolia) Collected in Tahiti. J Nat Prod 70(5):859-862. ↑ Lin CF, Ni CL, Huang YL, et al. (2007). Lignans and anthraquinones from the fruits of Morinda citrifolia. Natural Product Research 21(13):1199-1204. ↑ Levand O, Larson HO. Some chemical constituents of Morinda citrifolia. Planta Medica 36(2):186-187. ↑ Mohd Zin Z, Abdul Hamid A, Osman A, et al. (2007). Isolation and identification of antioxidative compound from fruit of mengkudu (Morinda citrifolia L.). International Journal of Food Properties 10(2):363-373. ↑ 14.0 14.1 Palu AK, Seifulla RD, West BJ. Morinda citrifolia L. (noni) improves athlete endurance: Its mechanisms of action. Journal of Medicinal Plant Research 2(7):154-158. ↑ 16.0 16.1 McClatchey, Will (2002). "From Polynesian Healers to Health Food Stores: Changing Perspectives of Morinda citrifolia (Rubiaceae)" (PDF). Integrative Cancer Therapies. 1 (2): 110–120. PMID 14664736. doi:10.1177/1534735402001002002. ↑ Thompson, RH (1971). Naturally Occurring Anthraquinones. New York: Academic Press. ↑ West BJ, Jensen CJ, Westendorf J. A new vegetable oil from noni (Morinda citrifolia) seeds. International Journal of Food Science and Technology 43(11):1988-1992. Wikisource has the text of the 1911 Encyclopædia Britannica article Aal. Noni: The Complete Guide for Consumers and Growers. Permanent Agriculture Resources. August 2006. පිටු 112. ISBN 0-9702544-6-6. "Noni culture on CultureSheet.org". 2008. http://culturesheet.org/rubiaceae:morinda:citrifolia. "The Noni Website". 2006. http://www.ctahr.hawaii.edu/noni/. Anthony, Mark. "Noni or NIMBY?". Foodprocessing.com. මේ පිටුව අන්තිමට සැකසුවේ 20 ජනවාරි 2018 දින දී, 03:57 වේලාවෙහිදීය.